We have been working hard at Periodic Products to manufacture a filter with CuLator Metal Eliminator inside…and we have done it! After years of research, we have manufactured a pleated filter with the power of CuLator! 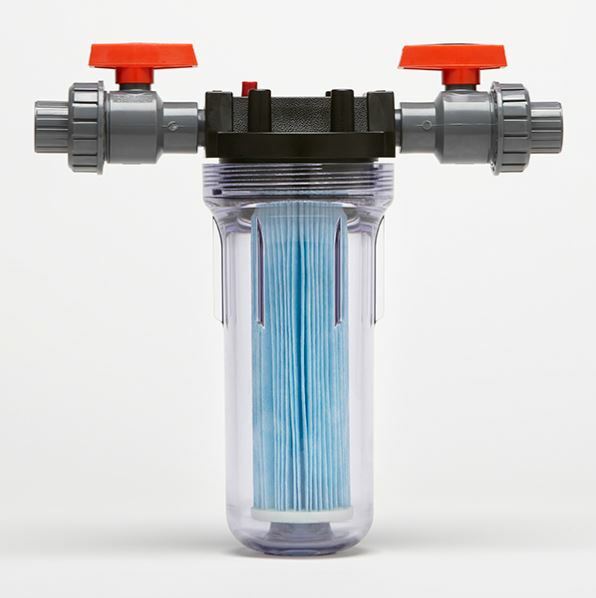 Plumbed into the swimming pool circulation system with 3/4″ connections, the CuLator InLine Pro allows a replaceable CuLator Filter to remove and eliminate up to 8 ppm dissolved metals from 20,000 gallons. This new pleated filter system is an improvement over traditional CuLator products because of the added surface area which allows the CuLator polymers to grab more metals like iron, copper, manganese, and lead from your pool and spa water faster. Don’t forget, that once the metals are bound to the CuLator, they are not coming off! So, you don’t have to worry about metals dropping back into the water like sequestering agents and other products. The clear sump allows you to see what metals the CuLator is removing from the water. Once the filters are used up, you just replace them with a new CuLator Filter. Continuous metal removal is the best way to prevent metal staining on your pool surfaces and to prevent water from turning brown or green when you shock. CuLator InLine Pro is available through your pool professional only. Call 954-764-7654 to learn more. This entry was posted in Uncategorized and tagged culator, CuLator 8 ppm, metal eliminator, metal free water, Metal remover, stain free pool. Bookmark the permalink. ← Iron Bacteria Eliminator Kit Worked!